The Association of Rural Banks (ARB) Apex Bank has donated clinical items and toiletries to the Atua Government Hospital as part of its 6th rural banking week celebration. 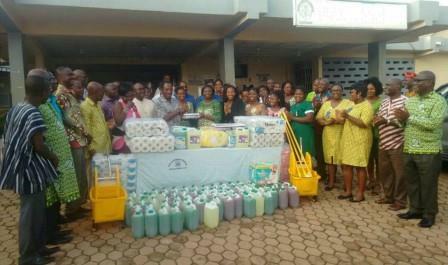 The items worth GHC 5,000 included antiseptics, liquid detergents, clinical gloves, Diapers, paper tissues and cleaning buckets. The National President of ARB Apex Bank, Dr Nana Akowuah Boamah, said the association was mindful of its corporate social responsibility as a step to strengthen the partnership between the people and the government in development. He indicated that his outfit was committed to partnering government in its agricultural policies as well as in the implementation of the one district one factory policy to provide job opportunities for the youth. Dr Boamah, expressed the hope that the items would be put to good use for the benefit of the people who would access healthcare at the facility. The Deputy Director of Nursing Services (DDNS) at the Hospital, Ms Marylove Nai-Williams who received the items thanked the association for the kind gesture extended to their facility and appealed to other organisations for an ambulance.